Home / Free Articles • Free content / Rigging or Roping? Twenty-five years ago, rope access was struggling for acceptance as an appropriate method of work on building and construction sites. Thanks to the efforts of committed individuals and associations, it is now common practice and there are currently tens of thousands of full time professional ‘Rope Access Technicians’ worldwide. By contrast, professional riggers have had a clear role on construction sites for hundreds of years. This article briefly discusses the evolving overlap between the equipment used and tasks conducted by these two professions. 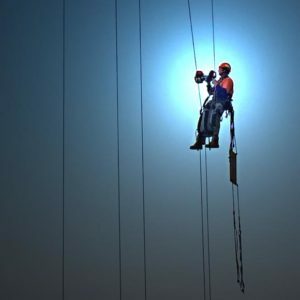 Rope access is generally understood to be a form of work positioning, and uses practical ropework to allow workers to access locations without the use of scaffolding, cranes or work platforms. 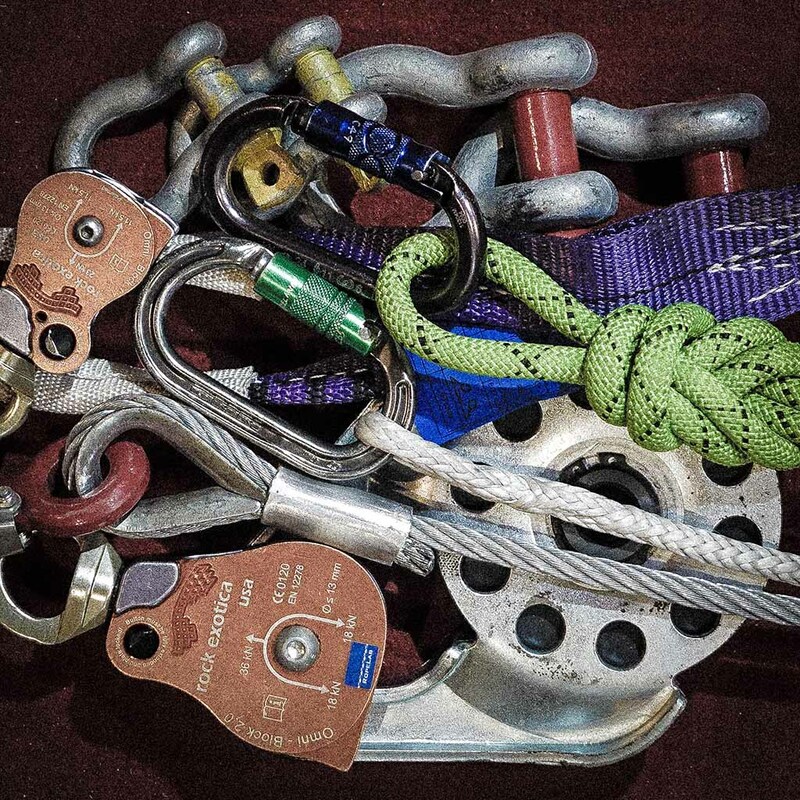 Tools may include synthetic kernmantle rope, carabiners, pulleys and various other devices. Much of the equipment and techniques have evolved from those used in climbing and caving. Among other things, technicians are trained in manoeuvring themselves effectively in a vertical environment, the use of their equipment, and rescue techniques. In contrast, rigging is generally understood to be the lifting and moving of loads using mechanical equipment. A rigger may use cranes and hoists along with flexible steel wire rope (FSWR, or steel cable), shackles, sheaves, chains, and synthetic round slings. In Australia, riggers also hold a dogger’s licence. A dogger slings and directs the movement of a load. Among other things, these workers are trained in the assessment of loads, the use of their equipment, and communication protocols. The training pathways, qualifications and licensing schemes applicable to these two professions are quite different. Traditionally, the two have also used quite different sets of equipment, however these lines are becoming increasingly blurred. It is now common to see industrial round slings being used on rope access sites and riggers are often using synthetic ropes to move some loads. 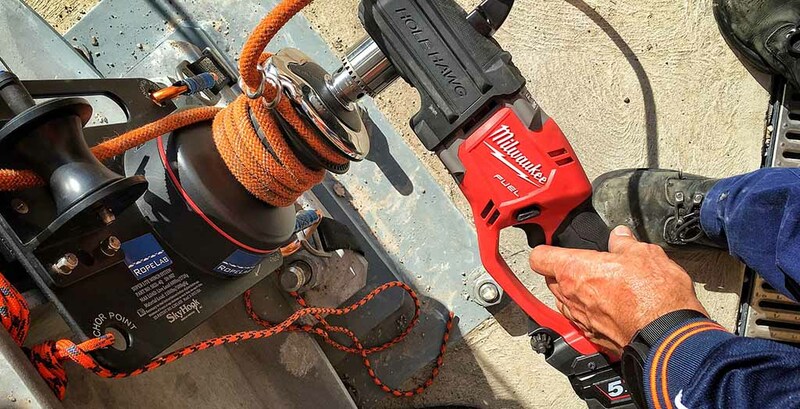 There are also many commercially available powered winches that rope access technicians are using to lift themselves, their co-workers, and various loads. There is a tendency to allow this cross-over of techniques and skill-sets to evolve without interference, however there are some significant issues that need conscious attention. Rigging equipment is marked with a Working Load Limit (WLL) and riggers know exactly what this means. In short, this value is the absolute limit for what each piece ‘is good for’. It may be de-rated or re-rated in each of many possible configurations defined on equipment tags or machine load charts. Most jurisdictions also require that this equipment is inspected and tagged at regular intervals. Rope access equipment is normally marked with its Minimum Breaking Strength (MBS). Many end users do not really understand how to interpret this value. 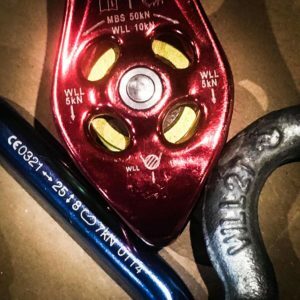 There is the real possibility that riggers have assumed that carabiners marked as ‘<-> 54kN’ are ‘good for’ this loading even though many manufacturers state that their carabiners should never be loaded above 25% of the MBS value indicated by such markings. More information on equipment markings, ratings, and Safety Factors can be found in this RopeLab report. In Australia, Safe Work Australia states that whenever a load is being moved using mechanical lifting equipment, a licensed rigger or dogger will be required to assess, sling and direct the movement. There are no quantified limits on what defines a ‘load’. There are some cases in which these workers may not be required. A rigger or dogger is not required to direct the lift when the load remains in view of the plant operator at all times. They may also not be required where the load, slinging, and lifting techniques do not require judgement, as they are predefined by a ‘competent person’. A competent person is defined as a dogger, rigger, or an engineer experienced in designing safe work lifting procedures. Rope Access Codes of Practice (CoP) are quite clear in their scope. They apply to rope access technicians who use rope based systems for access to, support during, and egress from places of work. The generally accepted maximum mass for a rope access technician (including tools and equipment) has come from the maximum allowable load stated for a Petzl harness, and is 140kg. The qualification schemes generally train and assess the skills required for one-on-one contact rescues using one set of ropes, so most technicians understand that their rope based system is ‘good for’ 280kg. As far as guidance on moving loads, the CoP’s normally state that any tool with a mass greater than a certain amount (8kg or 15kg for some associations) requires support from a system that is separate from that of the operator. Apart from this, there is no guidance about using rope based systems for moving non-human loads. With the use of powered winches becoming more widespread, it is conceivable that rope access technicians may be using their rope based equipment with powered winches to conduct lifting work of non-live loads up to 280kg, without any technician actually being involved in ‘Rope Access’. 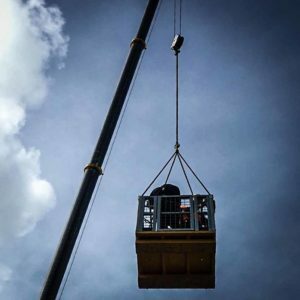 While it may appear to be feasible in some cases, this kind of work is technically beyond the standard training of a rope access technician and is more likely to fall in to the realm of rigging work. A rigger would have had training in how to accurately assess the load, how it may be securely suspended, and then moved safely with sound communication. A rope access technician may not have had this training. If you are considering using your rope access skills and tools in this way, your should actually check any local legislative requirements first. Again, most jurisdictions have very clear guidelines and rules governing the use of mechanical lifting equipment for moving people. These are in place to ensure the safety of the people being moved. For example, in Australia, if a mobile crane is being used, the person must be harnessed, in a man-box, and accompanied by a licensed dogger. The crane has mechanisms to protect against situations such as overloading, or dropping if the power is cut. The dogger normally has multiple ways to communicate directly with the crane operator. These may be visual signals, whistle signals, or direct radio contact. If radios are in use then these use private, secure channels. If current rope based systems are used with powered winches to move people through complex or confined environments, then I am not convinced that we have systems in place that adequately protect the person on the end of the rope. It should be possible to use appropriate equipment to complete a task even if that equipment is brought in from a different industry. Rope access technicians should be able to use rigging equipment and vice-versa, however there is an urgent need to formally address the ways in which this is done. It is reasonable to assume that rope based systems are capable of managing non-human loads, but it would be helpful to define some limits in this regard. Rope access technicians will continue to embrace developments in powered winching, so it is vital that significant thought and effort is put into developing specific documentation and appropriate training to better address this work. © Richard Delaney, RopeLab, 2016.